See the Spedale degli Innocenti with your own private guide on a 90-minute tour. Gain insight into architecture of what is considered the first fully Renaissance-style building, view artwork by Ghirlandaio and Botticelli, and hear about the children who lived at this 15th-century orphanage. 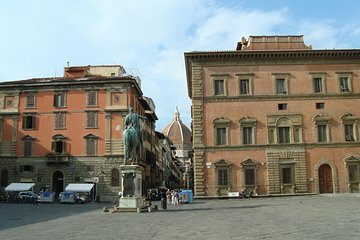 Make your own way to the Piazza Santissima Annunziata where the Spedale degli Innocenti is located. Designed as an orphanage in the 1400s by Filippo Brunelleschi, the building is home to several children's service organizations to this day. Your guide points out the elements that make the building a fine example of Renaissance architecture, including its columns and proportions, and shares details about its history. Renovated in 2016, the onsite museum exhibits a gallery of artworks by famous artists such as Ghirlandaio (who employed Michelangelo as an apprentice) and Botticelli, along with displays about the children who came through the orphanage.